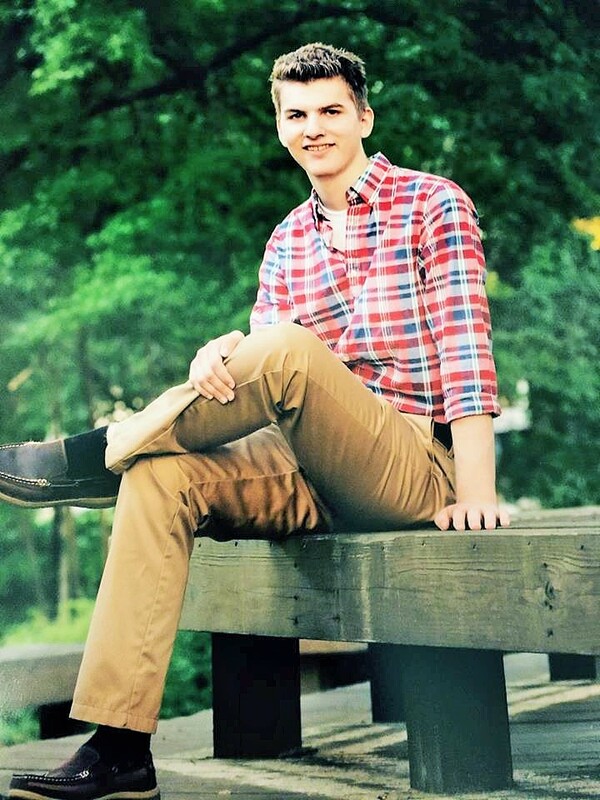 Miller graduated from high school at 4:00 on June 4, 2015. 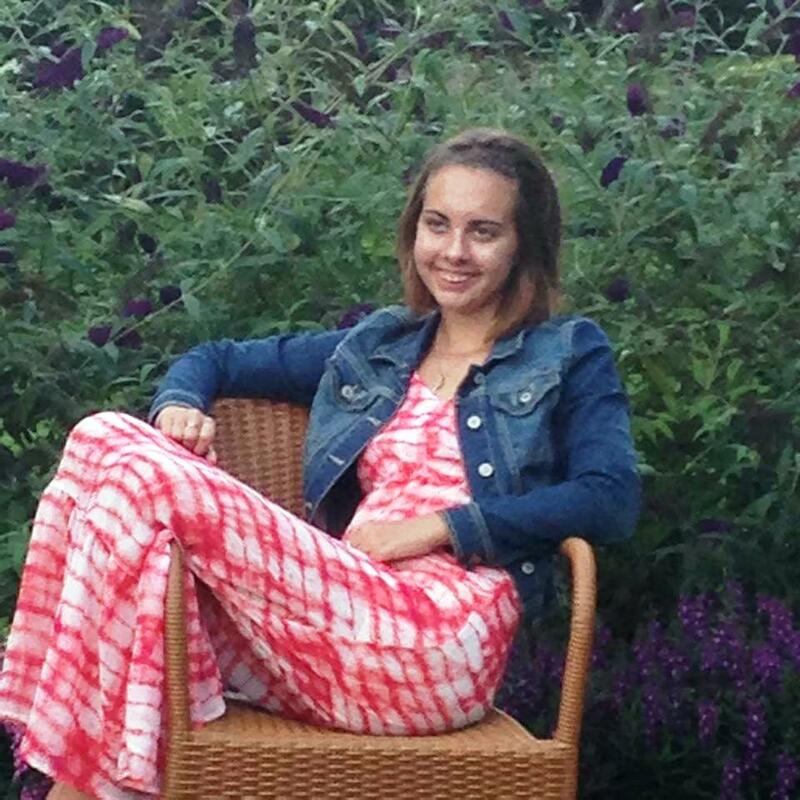 Haleigh graduated from high school at 7:00 on June 5, 2015. No problem…I can go to both! 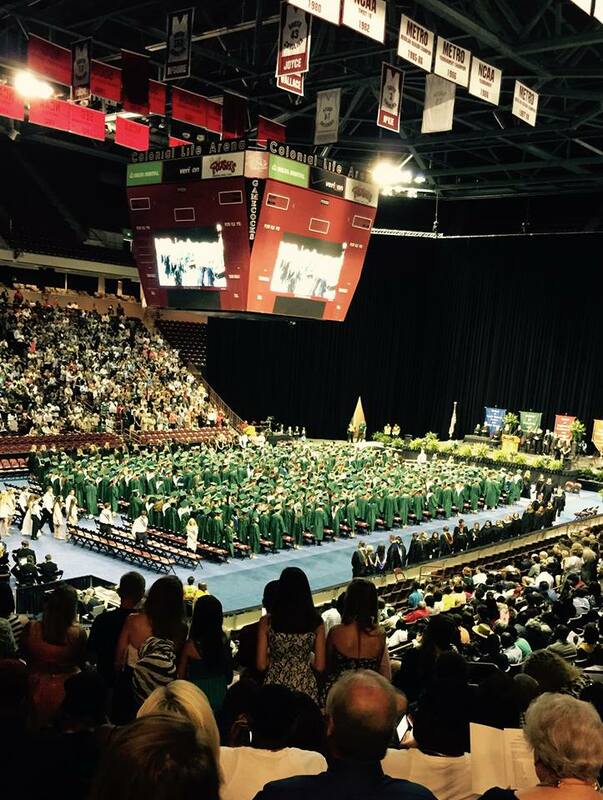 I have 15 grandchildren and am determined to be present at each one’s graduation, no matter where they live! Even if it means going to Malaysia, Canada, South Carolina, Illinois, Michigan! So far, so good! This year it was a bit tricky! 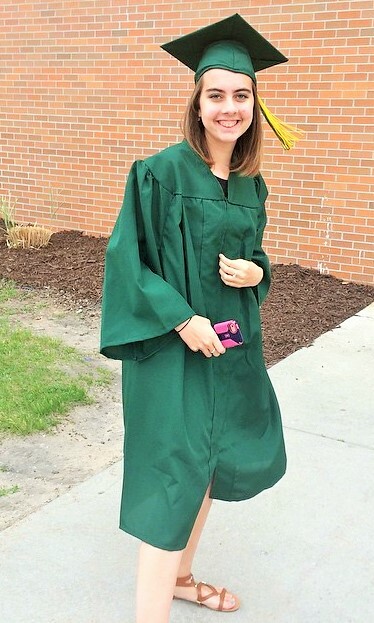 Miller graduated in South Carolina, Haleigh in Michigan…one day apart! 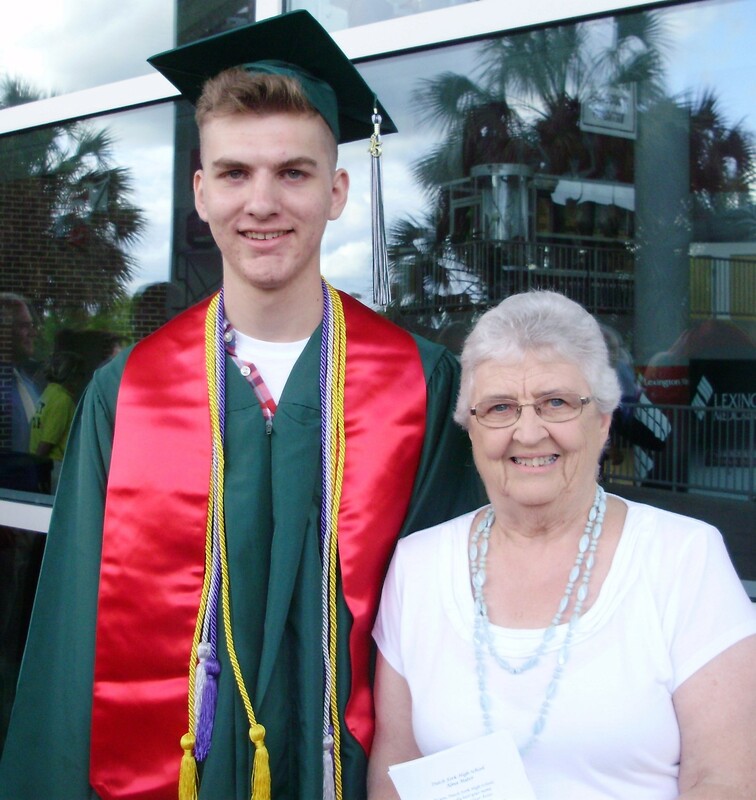 I flew to South Carolina and enjoyed a week with the family, ending with Miller’s graduation at 4:00 PM on Thursday, June 4. After graduation, there was a family and friends supper. Miller wanted home-made pizza! So there were at least four big pizzas made by my son-in-law, Sean, and neighbor, Ruth. They were all delicious! My favorite was ham and pineapple! Chips and homemade salsa and fruit were appetizers. 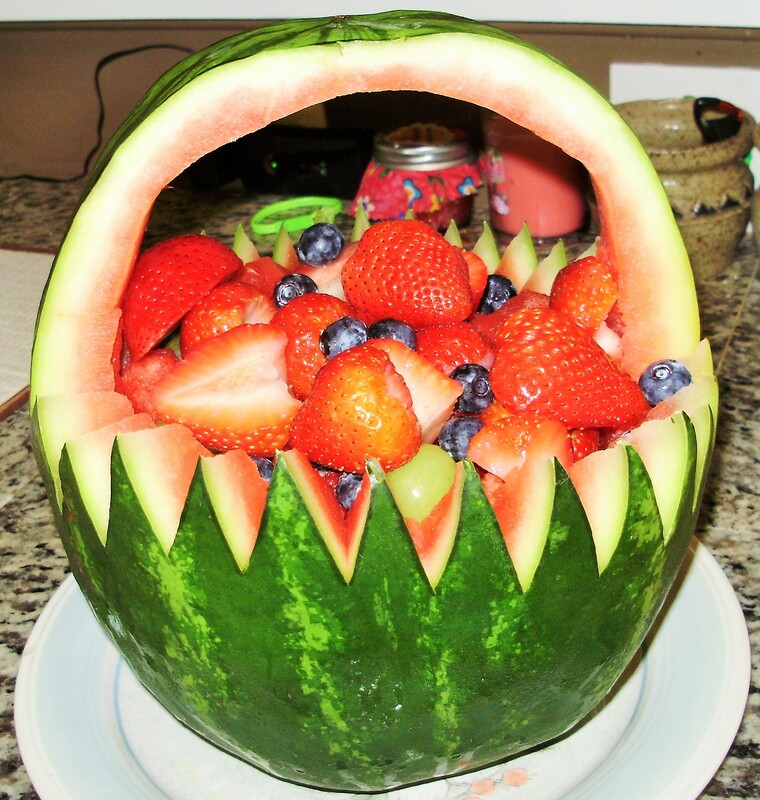 I made a watermelon fruit basket. I couldn’t find a long watermelon! I found a round one that was shaped just right and sat up perfectly! I filled it with watermelon balls, blueberries, strawberries, and green grapes. Oreo Ice Cream Cake was dessert made by Miller’s Aunt Corrie! At 5:15 AM, Friday morning, June 5, daughter, Christy, drove me to the airport to board my United Airline plane and go home for Haleigh’s graduation at 7:00 PM that evening. No problem. I would fly to Washington D C, then to Chicago, then to Midland, Michigan, arriving at 4:00 PM. 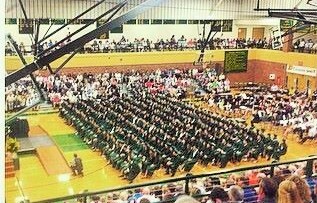 Graduation was to be at 7:00 PM! I could do this! No problem…WRONG! I had booked my plane through Cheapo Air. That was my big mistake! For some reason, I couldn’t print out my ticket. I always had before on flights. I did confirm my flight on-line before I left home! But not before I left Columbus! When we arrived at the airport I thought my flight was with United. Oh no, it was American Airlines! Well, skipping details here, I missed my plane! A kind gentleman booked me on another flight, but not to Washington DC! To Philadelphia, then to Chicago. I made that flight! I arrived in Philadelphia and found my gate only to discover I had missed my plane! What!? How could I miss two planes in one day? So another kind person booked me on another flight to Chicago. This time on US Air. I had to find my way from American terminal to US Air terminal! A very long way but I was given directions and I made it! When I arrived in Chicago I had to change terminals again! This time from US Air to United. Another very long way but I found it! Next I decided I’d better find a restroom. There wasn’t one nearby! I asked and was told where to go. On my way back to my gate, can you believe it? I got lost! I stopped to ask directions and a very kind young man offered to push me in a wheelchair! I told him I didn’t need a wheelchair, I just needed to find my gate. He took my suitcase and said, “I’ll take you there.” As we walked we visited. He was very young, 19 or 20 years; very good-looking; very friendly. I noticed he keep looking around for signs, we had to backtrack once. Finally, he told me he’d only been working there for three days! So he was still finding his way around! The name on his name tag was very strange so I asked him to pronounce it for me. “Oh! What country is that from,” I asked. He said, “Africa”. So I asked what country in Africa. His answer made me laugh! He said he googled it but he still doesn’t know! We had a good time visiting and finding our way back to my departure gate. I wanted to give him a tip for helping me. I didn’t have any idea how much I should give him. I gave him $3.00, but I wish I’d given him $5.00. If he had pushed me in a wheelchair I know I would have given him $5.00, but all we did was walk. But guess what! I’m not the only one who enjoyed our walking and talking! Before he left me at my gate, he gave me a big hug! I’m going to look for him anytime I’m in Chicago O’Hare Airport again! I wonder if he’ll remember me? I’ll never forget him! I arrived home on time! Jerry was waiting for me. He fixed a lunch for me, I took a shower and we left for Haleigh’s graduation ceremony! The end of a very long, but very worthwhile day! My grandchildren are worth it and this grandma was determined!!! This morning Jerry asked me how I felt about the day. Wasn’t I terribly frustrated? I was so glad I could tell him honestly that I knew God was with me all the way. I never doubted it. What a mighty God we serve! This entry was posted in Chicago, Daughter, Family, Flying, Fruit Basket, Frustration, Graduation, Grandchildren, Haleigh, Me, Michigan, Miller, South Carolina, Travel and tagged Chicago, Family, Graduation, Grandchildren, Haleigh, Me, Michigan, Miller, Philadelphia, Pizza, South Carolina, Travel, Watermelon Fruit basket. Bookmark the permalink. This was a mind-boggling trip, even for me who is used to snafus in travel. But I know how you think – Grandmas do whatever it takes. Lovely grand-kids. 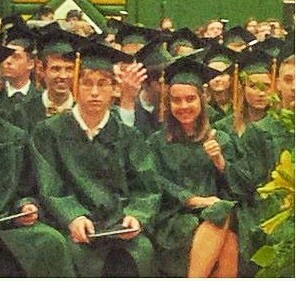 It looks like Miller is an honor graduate too.